I love looking through the grandinroad catalogs. They have so many unique and one of a kind items. 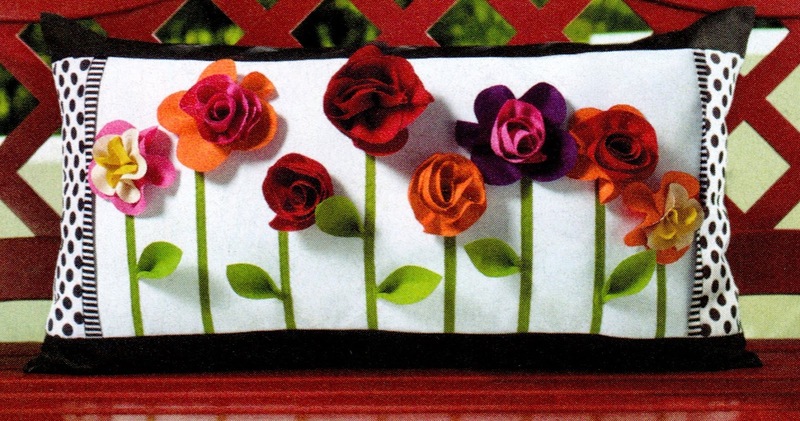 I came across a really cute outdoor pillow loaded with colorful flowers. It was described as "a stunning bouquet of dimensional spring blooms . . ." Yes, indeed, but at forty-nine dollars it was way out of my budget to purchase, but not to try to re-create. I was so inspired . . . . I've been thinking about trying to make this pillow for quite a while. With right sides together, I used heat n bond to fuse the two ends together. Once cooled, I turned the pillow inside out. Next, I took black/white pattern ribbon and glued it around the pillow at the seams with Fabri-Tac fabric glue, one side at a time. Then I added adhesive backed ribbon beside the glued ribbon, smoothing and pressing down and around. Making the flowers proved a bit daunting. I had to "play" around with making them visually using colors of ribbon and satin fabric (mostly purples) I had in my stash. I cut a few flower patterns out of the satin fabric and passed them over an open candle flame to prevent fraying. But mainly I just twisted, folded and rolled the ribbon until I was satisfied with the look of trying to duplicate the flowers. 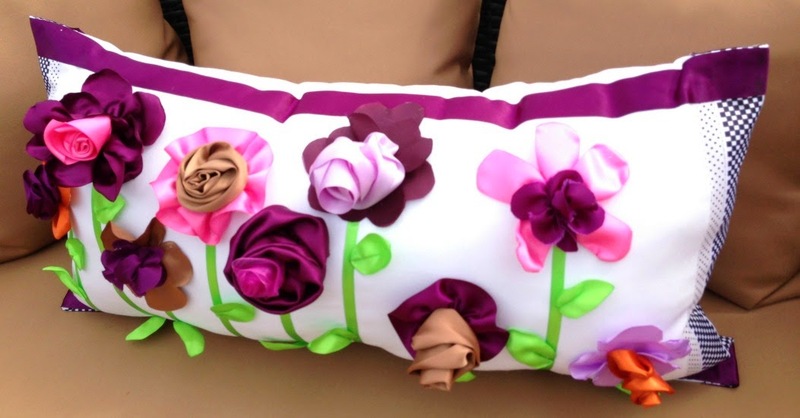 I know I said this is a no sew pillow and I did baste some of the flowers together. I glued most of the flowers together and those I basted could be glued, too. I was really experimenting with ways to make the flowers. 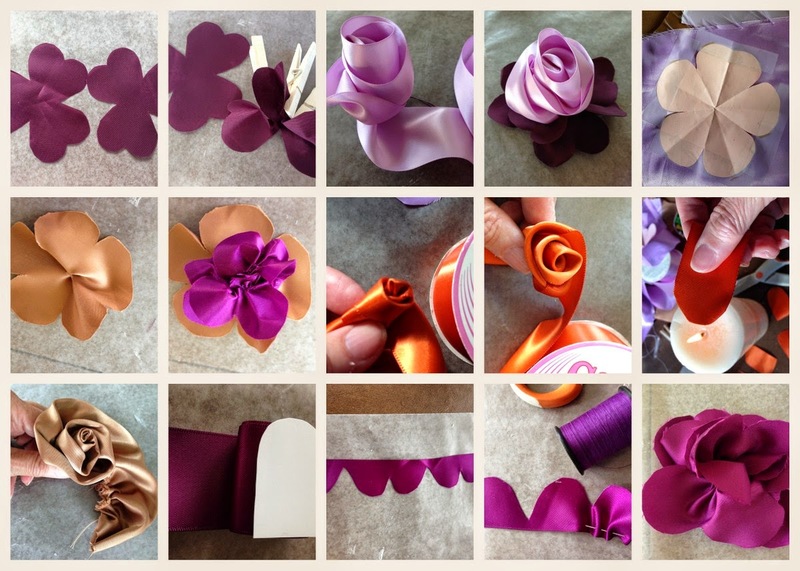 You can find lots of tutorials on making ribbon flowers online so I'm not going into details. I must say that practicing how to make them a few times was very helpful. 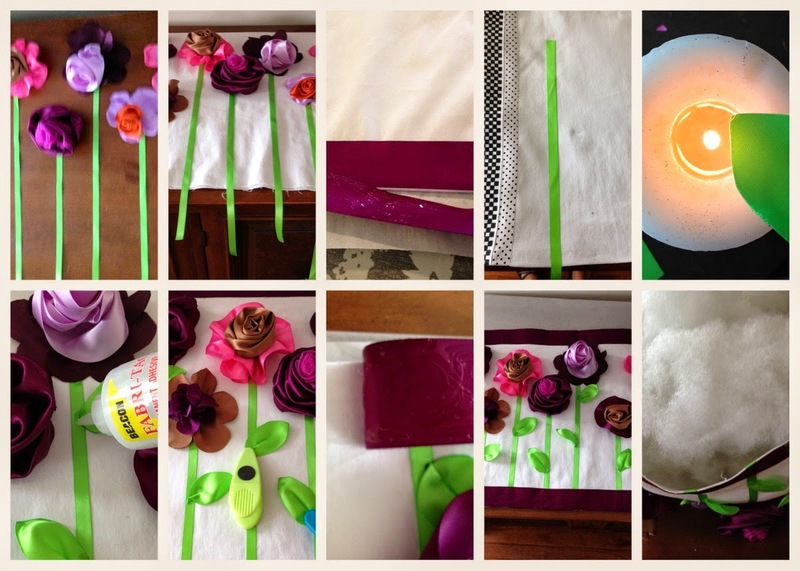 Once all the flowers were made, I laid them out, first on a table and then on the fabric pillow case. I didn't want the black (didn't have black anyway) borders on my pillow so I glued a purple ribbon border on the top instead. I then glued the stems on, and added the flowers, one at a time. After gluing all the flowers and stems on, I made leaves by cutting out freehand oval shapes and passing the edges over a flame. By folding the leaf together and holding it over the flame and pressing together, a more defined line, fabric curvature and leaf look occurred. After all the leaves were glued on, I added the bottom purple ribbon border. I used poly fiber fill to stuff the pillow cover. A form that size, if I could find one, would be too costly. After stuffing the pillow I sealed it together by adding glue to the seams and holding it together with clips until dry. Sewing the closing seam together might have been easier and neater to do, but like I said, I wanted this to be a no sew project. And I loved how it turned out! The finished pillow is really stunning! And it looks amazing on my patio furniture. I have no intentions of leaving this pillow out to the elements. I don't leave my cushions out so I know I won't with the pillow either. I have an outdoor fabric spray that seals fabric. All the ribbon I used was 100% polyester, but I don't know how the satin would react. I'm not taking any chances. I'm just satisfied I could create something similar to the pillow I so admired. Hope this has been inspiring for you, too! Beautiful job, Gail! It looks so nice outside. Your yard is very nice too btw. Beautiful pillow. But may be I am not too smart. I have a hard time understanding how to make this pillow without sewing, I'm not all that clear what exactly to do even I would love to make a no sew pillow. How beautiful pillow! I love all amazing flowers! Yippee! A no-sew pillow - my kind of project. Heat bond is my friend. Did you intend for the pillow flowers to match the ones in your yard? Love this idea! Wow...that is fabulous! I definitely love no-sew projects, and I think I could handle this. Sooo beautiful Gail. Beautiful pillow and I like the idea of not having to use the sewing machine. Nice patio furniture, the pillow really pops with the color out there! You know you had me at "no-sew"!!! That is one gorgeous pillow and it does look great on your patio furniture. I still adore your patio and your flowers in the background look beautiful. You are the tutorial queen lady! I love the pillow! I can't believe there is no sewing involved. Thanks for the easy to follow instructions. Много красива възглавничка, прекрасно украсява вашата тераса. Поздрави от мен и Страната отвъд дъгата. This is great! Thank you for sharing... following from the Wake up Wednesday link up! 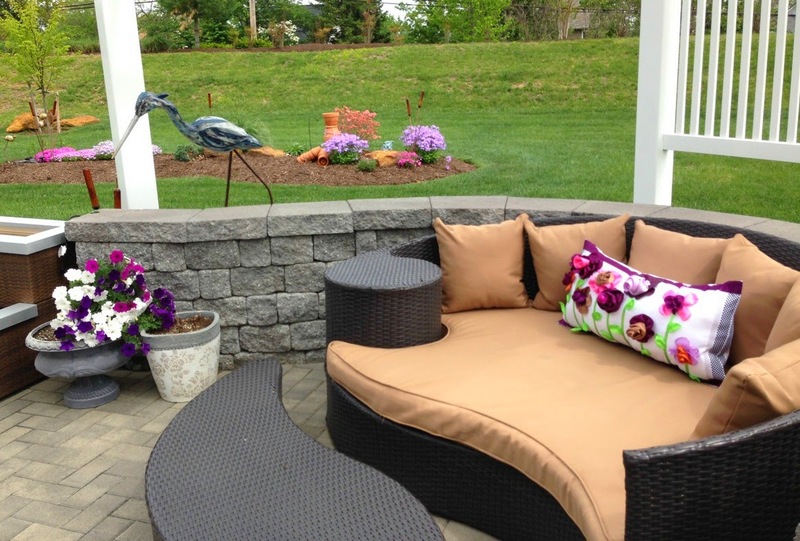 loving your patio, and what vibrant colors that pillow adds! well done. Your pillow is beautiful! Amazing that you were able to make it with no sewing! I love how it matches your other flowers on your patio. Love your gorgeous pillow - amazing it involved no sewing! Great pillow and tutorial. 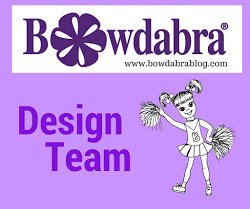 We have a link party and would love to have you share this there. It runs from Tuesday nights until Sunday night. Beautiful pillow :) great tutorial .. So cute and I love the no sew option. I will admit to using a stapler to make my daughters curtains once. I hate to sew! so pretty! 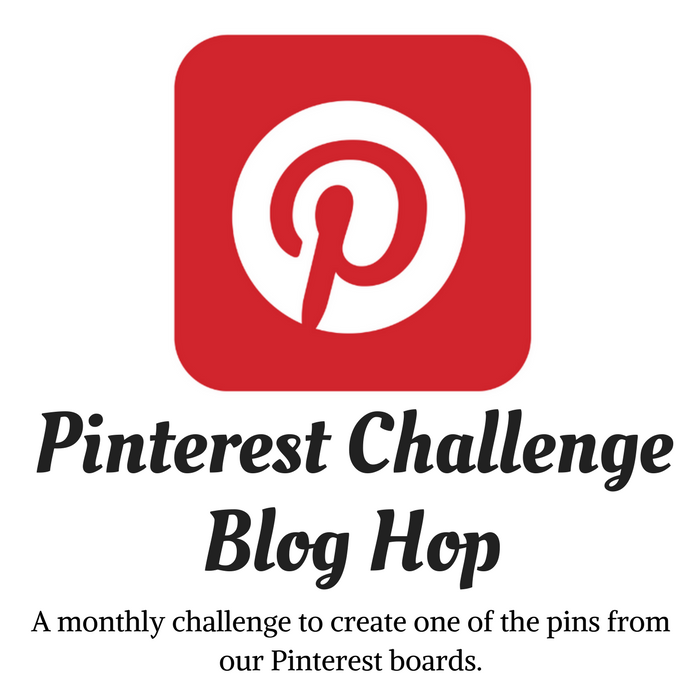 I'm pinning for later! Thank you for sharing. 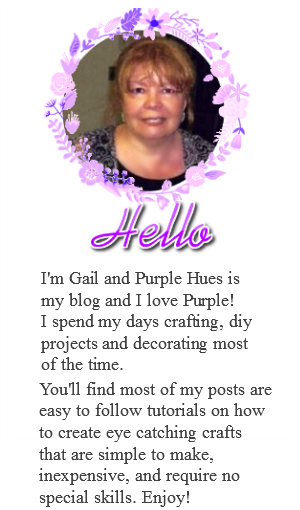 Gail, this is just fabulous, and just my speed, "no sew"! It looks amazing! Thanks for sharing the tutorial. Looks awesome!!! !I love the fllowers!!! So pretty. I might make this for my daughter's room. She is 4 so I wouldn't spend that much money for the original pillow. But if I made her one, it would be so much cheaper. Will have to try this out soon. 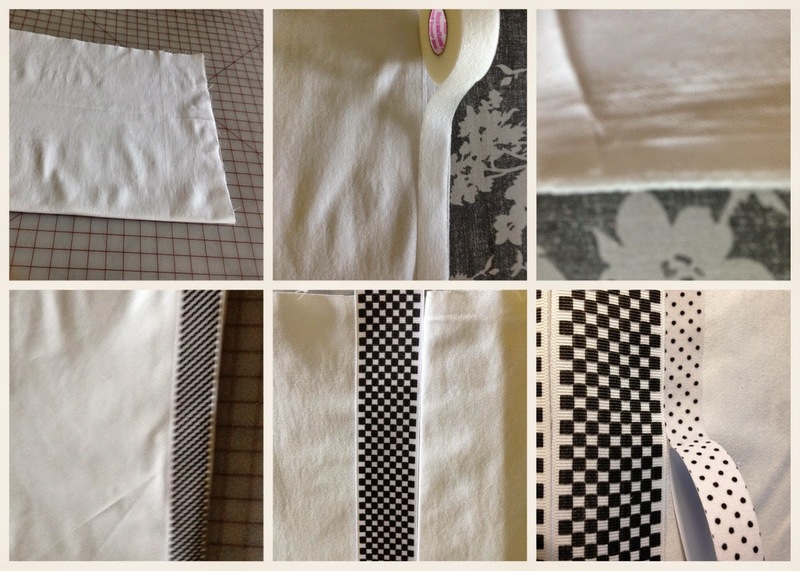 Thanks for sharing your new-sew project at the Say G'Day Saturday linky party! I've just shared this on G+ and Pinterest. What a gorgeous pillow....will it get rained on out doors? It looks so pretty with the garden flowers in the background. The pillow is Lovely and looks great! Easy to follow instructions as well! I also wanted to say that your yard is AMAZING! I would never want to go in.